In the heart of the united Germany lies Th�ringen, a federal state were a lot of history was written. Famous persons like Luther, Bach and Goethe left their footprints in this area. Now the GRD is history, this charming region, rich in nature and with many beautiful historic towns like Weimar, Ehrfuhrt and Eisenach, is discovered more and more by tourists. 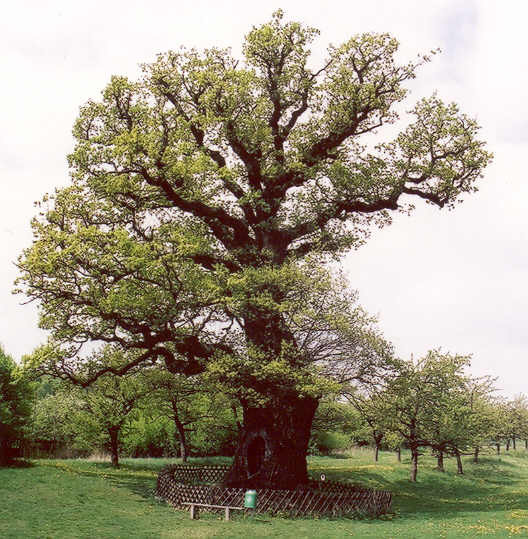 In Th�ringen there are at least three famous so called "thousend year old" oaks. Interesting to visit them and to know if this claim has some truth in it. In the west of Th�ringen, near the town of M�hlhausen, lies the village Volkenroda. It is small, but has a big old Monastery, with an imposing new part. Near to it this Oak stands, wich is called the Kings Oak or the Thousand year old Oak. 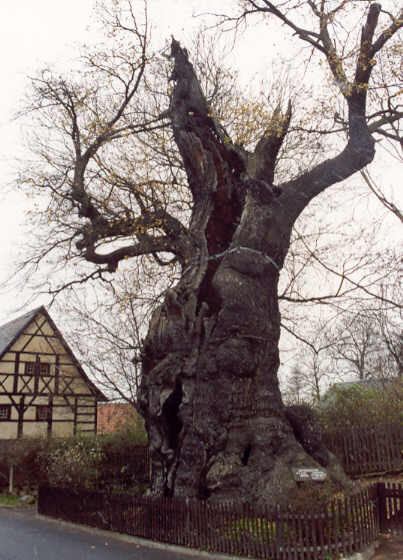 It is among the biggest and most impressive oaks of Germany, with a heavy trunk of over 950 cm (31� feet) circumference. It is 23 m tall and has a rather healthy crown. In the past the oak lost some very heavy limbs: two big ones were teared off by lightning in 1989. In the southside of the trunk is a large hole: here once was an enormous horizontal branch 16 m long. The oak is hollow but has an imposing broad foot. Since 1831 the girth was measured regularly at 1,7m above the ground: in 1831 it was 690 cm, in 2001 950 cm. The growth of 260 cm in 170 years gives a medium of 1.53 cm a year. Extrapolation to its earlier life gives an age of 621 years, but while linear growth in the youth probably was greater, it could be nearer to 500 years. Near the birthplace of Johann Sebastian Bach, Eisenach in Th�ringen, lies the hamlet of Berteroda. It is mentioned already in a document of 948. Near the school and the village-pond this veteran Oak resides, allegedly dating from this dark period. Data of its growth since the last century point out it cannot be much older than 500 years, notwithstanding its circumference of 10,04 m ( 33 feet). Still, it is a very remarkable tree with deep furrows and big knots. The crown is ruined for a great part, recently, during a thunderstorm, a big branch is broken off. More to the east in Th�ringen, not far from Altenburg and again in a small hamlet, N�bdenitz, this stange old giant is standing, a tree-ruin. The crown was destroyed by a storm in 1812. 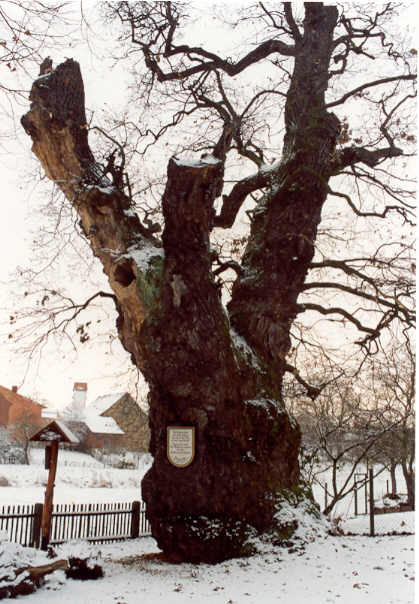 On a plate near the oak is written that in 1824 a Minister of the Duchy of Altenburg, the knight 'Von Th�mmel' was buried under the hollow trunk. Like the two other oaks this one, with its girth of 10,2 m (33� feet), is thought to be a 1000 years old, some say it is even older. It was already hollow in 1800 but again the exact age of this oak probablly never will be known, regarding the hollow trunk and the scanty old data. At least it gives the impression of being the oldest of these three oaks. To my guess it could be 600 to 700 years.